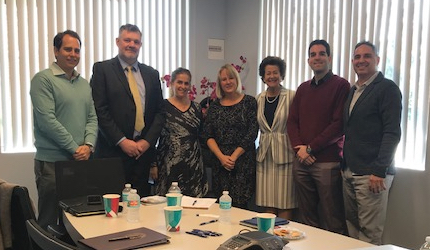 The Economic Engine Performance Report Strategy Committee met Wednesday at Hyde Shipping to kick-off preparations for the April 26, 2019 luncheon program. Pictured from left are: EEPR Event Chairman, David Candib, Carnival Corp.; Bruce Beckman, Emirates Airline; Jodi Davidson, Colodny Fass; Lori Brantley, Hyde Shipping; Lori Baer, PEA; Oscar Pascual and Tom Spina, Carnival Corp.
Now in its 11th year, the Economic Engine Performance Report is the largest and most significant annual gathering of Broward County’s business community. To participate as a sponsor, Table Host or individual, call PEA 954-463-2801, or go to the PEA website www.portbiz.org and click on Economic Engine Performance Report link.